Wayne Healy (born 1946) grew up in East Los Angeles, where political events in the 1960s stimulated his commitment to execute socially and culturally relevant public art. In the third grade he collaborated on a dinosaur mural with David Botello. In 1975, the two ran into each other after many years, and Healy and Botello co-founded what became the mural team known as East Los Streetscapers. 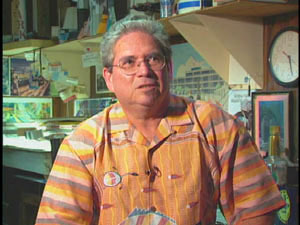 In 1992 Healy and artist Roberto Delgado were awarded a grant by the Joint Spanish/U.S. Committee for Educational and Cultural Cooperation to paint murals in Barcelona, Spain. They have created murals and public art works throughout the United States, Europe and Mexico with traveling exhibitions including "Le Demon des Anges", "2001: Hispanic Artists' Odyssey," and "Chicano Codices," Mexican Museum, San Francisco, California. Healy’s work was also featured in Chicano Visions: American Painters on the Verge - a traditional art exhibition presenting the works of a wide range of the country's Chicano and Chicana artists.